The morning sin shines down on a particularly peaceful Westbourne Grove, tranquil suburb of London and "media central", according to the man who's quaffing an 11 o'clock Jamison's and Coke. There's a mildly bitter tone in his wry observation and no small amount of self-deprecation. 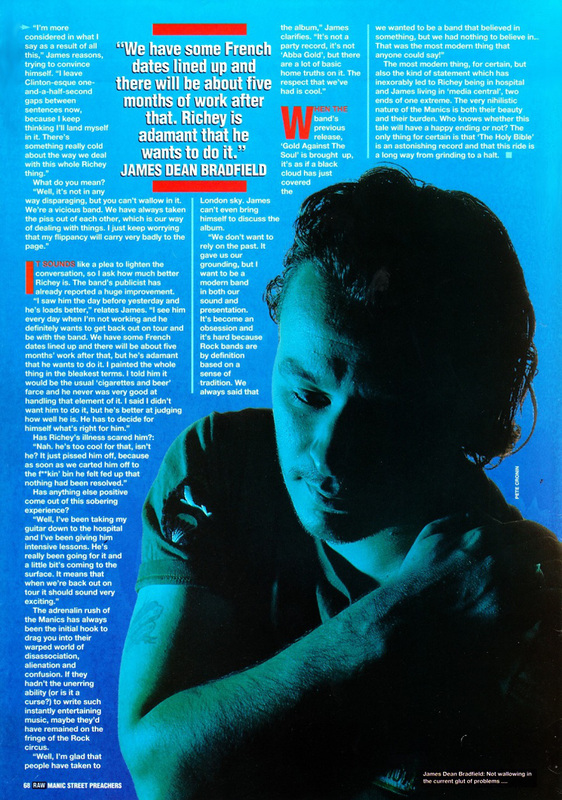 For this is James Dean Bradfield, musical mainstay of Manic Street Preachers and erstwhile reluctant interviewee of the band. Possibly with an element of design, but certainly through accident, Bradfield finds himself going through the media mincer. As we all know, it's a lot less to do with the disturbing, aching, yet quite brilliant work contained on 'The Holy Bible', the Manics' third and, to date, definitive album, and a lot more down to the group's frail spirit, Richey James, and his current place of residence. 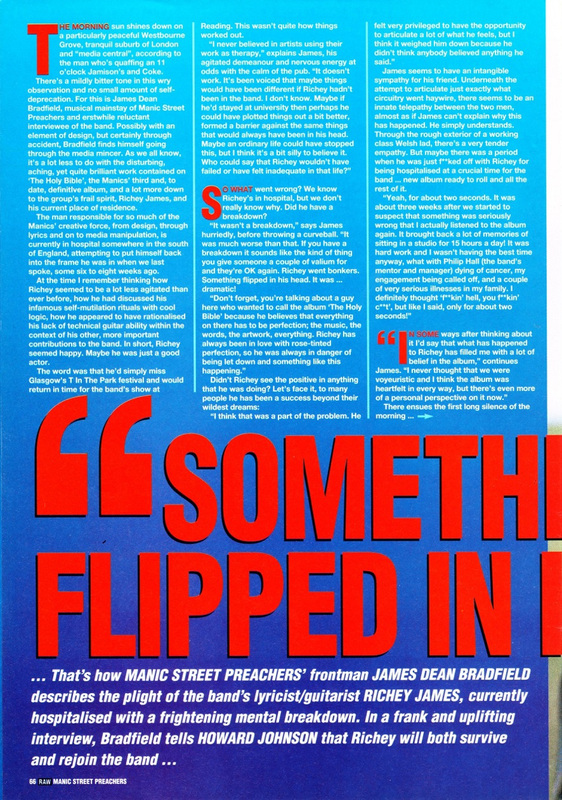 The man responsible for so much of the Manics' creative force, from design, through lyrics and on to media manipulation, is currently in hospital somewhere in the south of England, attempting to put himself back into the frame he was in when we last spoke, some six to eight weeks ago. At the time I remember thinking how Richey seemed to be a lot less agitated than ever before, how he had discussed his infamous self-mutilation rituals with cool logic, how he appeared to have rationalised his lack of technical guitar ability within the context of his other, more important contributions to the band. In short, Richey seemed happy. Maybe he was just a good actor. The word was that he'd simply miss Glasgow's T In The Park festival and would return in time for the band's show at Reading. This wasn't quite how things worked out. "I never believed in artists using their work as therapy," explains James his agitated demeanour and nervous energy at odds with calm of the pub. "It doesn't work. It's been voiced that maybe thing would have been different if Richey hadn't been in the band. I don't know. Maybe if he'd stayed at university then perhaps he could have plotted things out a bit better, formed a barrier against the same things that would always have been inn his head. Maybe an ordinary life could haved stopped this, but I think it's a bit silly to believe it. 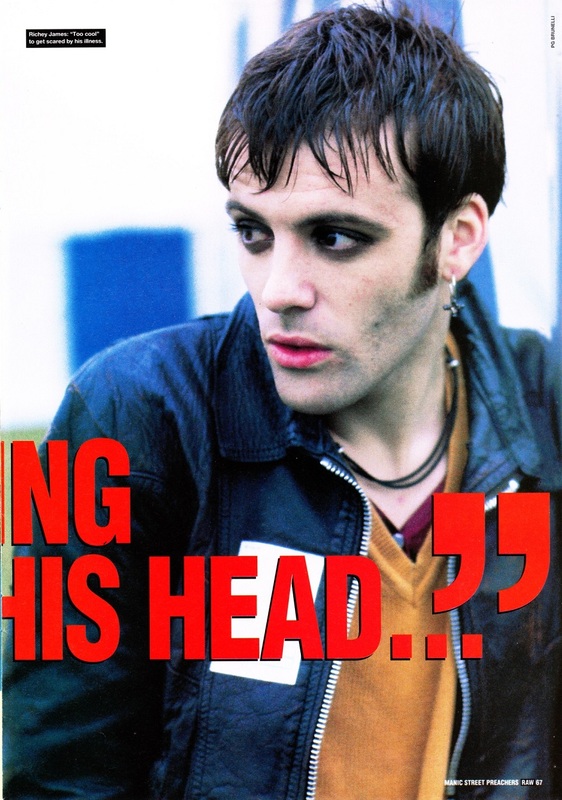 Who could say that Richey wouldn't have failed or have felt inadequate in that life?" So what went wrong? We know Richey's in hospital, but we don't really know why. Did he have a breakdown? "It wasn't a breakdown," says James hurriedly, before throwing a curveball. "It was much worse than that. If you have a breakdown it sounds like the kind of thing you give someone a couple of valium for and they're OK again. Richey went bonkers. Something flipped in his head. It was...dramatic!" "Don't forget, you're talking about a guy here who wanted to call the album 'The Holy Bible' because he believes that everything on there has to be perfection; the music, the words, the artwork, everything. Richey has always been in love with rose-tinted perfection, so he was always in danger of being let down and something like this happening." "I think that was a part of the problem. He felt very privileged to have the opportunity to articulate a lot of what he feels,but I think it weighed him down because he didn't think anybody believed anything he said." James seems to have an intangible sympathy for his friend. Underneath the attempt to articulate just exactly what circuitry went haywire, there seems to be an innate telepathy between the two men, almost as if James can't explain why this has happened. He simply understands. Through the rough exterior of a working class Welsh lad, there's a very tender empathy. But maybe there was a period when was just as f***ed off with Richey for being hospitalised at a crucial time for the band...new album ready to roll and all the rest of it. "Yeah, for about two seconds. It was about three weeks after we started to suspect that something was seriously wrong that I actually listened to the album again. It brought back a lot of memories of sitting in a studio for 15 hours a day! It was hard work and I wasn't having the best time anyway, what with Philip Hall (the band's mentor and manager) dying of cancer, my engagement being called off, and a couple of very serious illnesses in my family. I definitely thought 'f**kin' hell, you f**in' c**t', but like I said, only for about two seconds!" "In some ways after thinking about it I'd say that what has happened to Ricehy has filled me with a lot of belief in the album," continues James. "I never thought that we were voyeuristic and I think the album was heartfelt in every way, but there's even more of a personal perspective on it now." "I'm more considered in what I say as a result of all this," James reasons, trying to convince himself. "I leave Clinton-esque one-and-a-half-second gaps between sentences now, because I keep thinking I'll land myself in it. There's something really cold about the way we deal with this whole Richey thing." "Well, it's not in any way disparaging, but you can't wallow in it. We're a vicious band. We have always taken the piss out of each other, which is our way of dealing with things. I just keep worrying that my flippancy will carry very badly to the page." It sounds like a plea to lighten the conversation, so I ask how much better Richey is. The band's publicist has already reported a huge improvement. "I saw him the day before yesterday and he's loads better," relates James. "I see him every day when I'm not working and he definitely wants to get back out on tour and be with the band. We have some French dates lined up and there will be about five months' work after that, but he's adamant that he wants to do it. I painted the whole thing in the bleakest terms. I told him it would be the usual 'cigarettes and beer' farce and he never was very good at handling that element of it. I said I didn't want him to do it, but he's better at judging how well he is. He has to decide for himself what's right for him." Has Richey's illness scared him? "Nah, he's too cool for that, isn't he? It just pissed him off, because as soon as we carted him off to the f**kin' bin he felt fed up that nothing had been resolved." Has anything else positive come out of this sobering experience? "Well, I've been taking my guitar down to the hospital and I've been giving him intensive lessons. He's really going for it and a little bit's coming to the surface. It means that when we're back out on tour it should sound very exciting." The adrenalin rush of the Manics has always been the initial hook to drag you into their warped world of disassociation, alienation and confusion. If they hadn't the unerring ability (or is it a curse?) to write such instantly entertaining music, maybe they'd have remained on the fringe of the rock circus. "Well I'm glad that people have taken to the album," James clarifies. "It's not a party record, it's not 'ABBA Gold', but there are a lot of basic home truths on it. The respect that we've had is cool." When the band's previous release 'Gold Against The Soul' is brought up, it's as if a black cloud has just covered the London sky. James can't even bring himself to discuss the album. "We don't want to rely on the past. It gave us our grounding, but I want to be a modern band in both our sound and presentation. It's become an obsession and it's hard because Rock bands are by definition based on a sense of tradition. We always said that we wanted to be a band thagt believed in something, but we had nothing to believe in...That was the most modern thing that anyone could say!" The most modern thing, for certain, but also the kind of statement which has inexorably led to Richey being in hospital and James living in 'media central', two ends of one extreme. The very nihilistic nature of the Manics is both their beauty and their burden. Who knows whether this tale will have a happy ending or not? The only thing for certain is that 'The Holy Bible' is an astonishing record and that this ride is a long way from grinding to a halt. This page was last modified on 15 May 2018, at 06:20.